Low surface temperature radiators have been part of the heating landscape for several years now, but modern versions offer a number of new benefits. 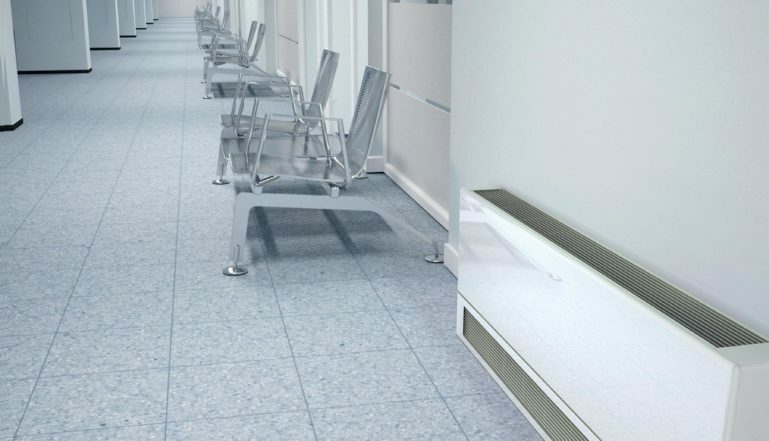 LST radiators are key where there is a need for special heat emitters that are ideal for safety critical environments – especially those that need to meet NHS Guidance for ‘Safe Hot Water and surface temperature’ – in hospitals, care and nursing homes, as well as sheltered housing, schools and nurseries. It’s a specification requirement of building designers and architects that the heat emitters in these buildings protect the young, the elderly and the vulnerable, who will live in or visit buildings such as these. When asking whether LST radiators are needed, you only need to consider the risk of in particular, older people falling and injuring themselves on a radiator along with potential dangers from those with a visual impairment bumping into or brushing against radiators. Some elderly people have a reduced sensitivity to high temperatures and others simply cannot react quickly enough to prevent injury from hot surfaces if they inadvertently touch and come into contact with a conventional radiator, where surface temperatures may be as high as 75°C. Older people and those suffering injuries have an increased susceptibility to losing their balance and falling, and the possibility of these people falling and becoming trapped against a conventional radiator brings the need for LST radiators sharply into focus. And of course, the injuries that are possible to the very young are too horrific to contemplate, so it’s clear that serious burns can be caused very quickly at these temperatures and that LST radiators are the obvious response to the dangers. Incorporating a casing that covers the radiator – providing a physical barrier between the heat emitter and the people they are designed to keep warm – makes huge sense, and in most LST radiators, the casing also covers the incoming pipework making sure all the heated surfaces are concealed and that any exposed surfaces stay at a safe temperature of no more than 43°C. In addition, LST radiators need to be designed to ensure they offer as much protection as possible to those for whom they are designed to provide heating – to include ensuring rounded corners and edges to the design to avoid damage from sharp edges. Remembering that LST radiators are in the main installed in buildings to offer protection to older people, additional benefits such as safety grilles, easy to operate heating controls and even arthritic adaptors for people who are unable to grip controls easily, can be incorporated to provide a user friendly ‘package’ for those they seek to help. Bearing in mind where many LST radiators are installed, it’s vital that they are built to be robust and able to withstand and resist vandalism and day to day wear and tear, from being knocked into by trolleys and wheelchairs – especially in hospitals and nursing homes. Casings are held by security fittings that are quick and easy to install. The security fittings have a unique seam fixing bracket system that prevents unauthorised access to the emitter accommodated inside. In addition, LST radiators – for additional protection – have an additional long lasting, anti-bacterial paint coating, which provides an additional valuable benefit for the environments in which they are installed.